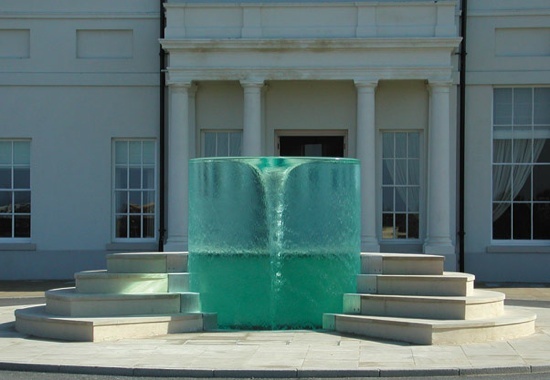 Fountains have been used since history began to add character and ambience to outdoor spaces. 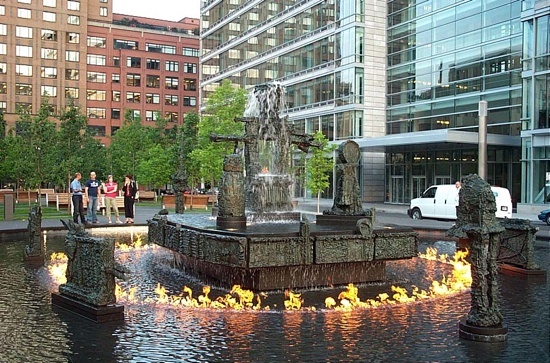 This list looks at ten of the more spectacular or fascinating fountains from around the world. Be sure to mention your own favorites in the comments. 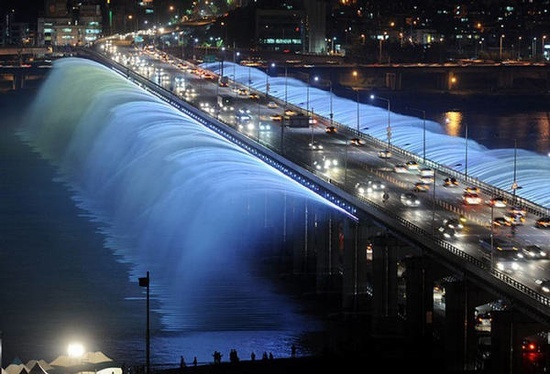 The Banpo Bridge fountain at 1140 meters long (approx. 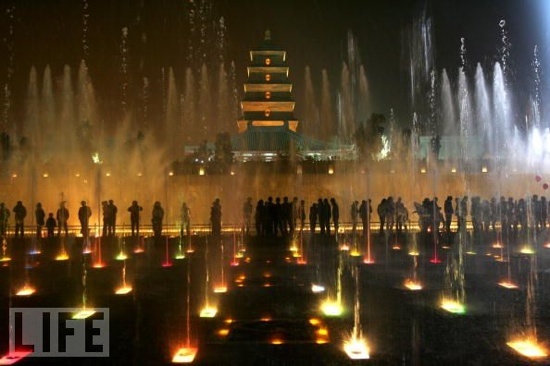 3740 ft.) is the worlds longest fountain. It has 380 nozzles that pump out 190 tons of water a minute. 220 lights in a kaleidoscope of color garnered it the name of Moonlight Rainbow Fountain. 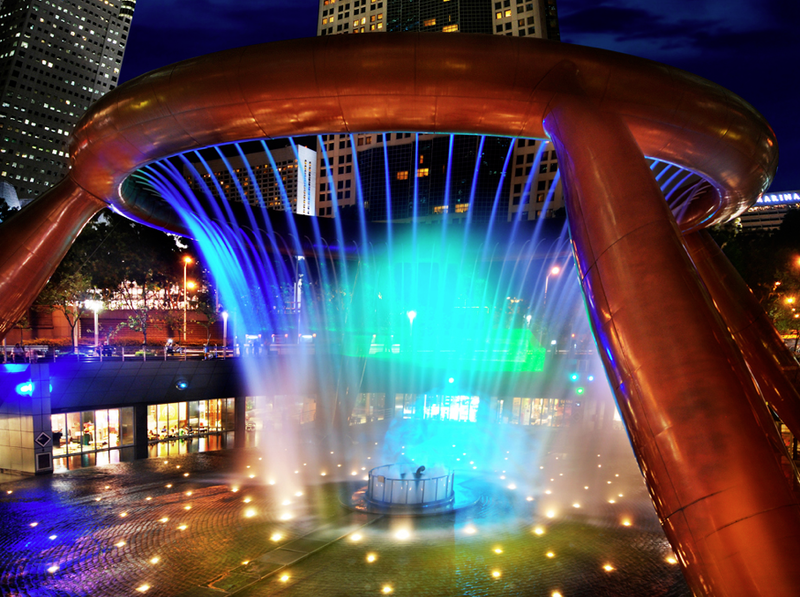 Located in the Suntec City Mall the fountain of wealth was created for luck using Feng Shui . The base is 16,831 sq. meters(approx. 55,219 sq. ft.) and stands about 30meters(1181 ft.) high. Made in bronze it weighs approximately 85 tons and is situated on top of an underground restaurant that allows you to look above and view the ring. Named for the cemetery site it was built on the Fontaine Des innocents was created by renaissance architect Pierre Lescot and sculpted by Jean Goujon. It was located in the cemetery de Innocents until 1788 when it was moved and it made its way to its permanent location in 1858. The fountain is in the style of mannerists which tend to be tall and thin. The fountain is decorated with plump little boys with wings common to the period. 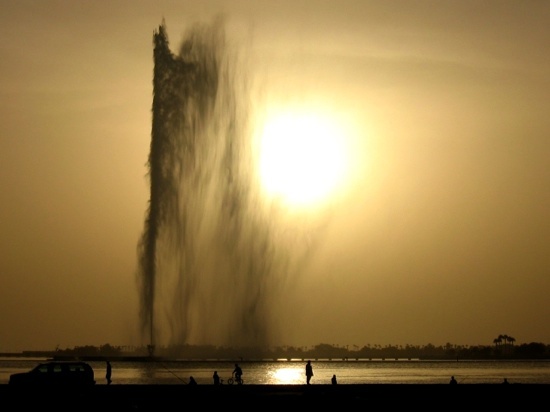 Also called Jeddah fountain because of its location this fountain is the tallest water fountain in the world. Shooting water measures taller than the Eiffel tower minus the antennae. Water shoots out at 233 mph and reaches 1024 into the sky. The fountain has a maintenance schedule of daily, weekly, bi-weekly, monthly, half-year and yearly checks because of the salt water and high pressure jets. Jeddah Fountain dominates the sky line in the city and was donated by the late King Fahd bin Abdul Aziz. The Big Wild Goose Pagoda is the back drop of what claims to be the largest musical fountain in Asia with the longest light bar. The fountain has 22 different sprays that can be used to create a large folding waterscape. Fire can also be seen at times shooting out of the holes. The Trevi Fountain is the considered the largest baroque style fountain. The fountain resided at the end of the Aqua Virgo aqueduct (which was built in 19 B.C.). 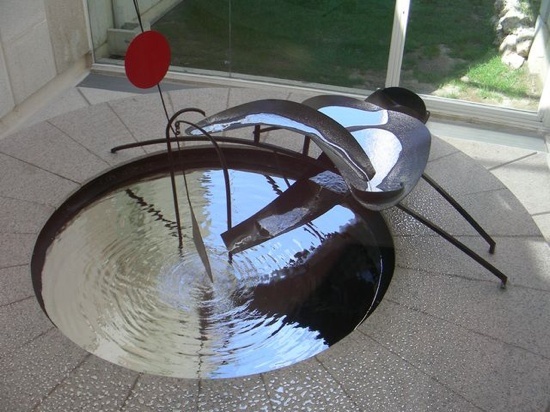 The fountain was designed to represent the many fluctuating moods of the sea. Neptune is the center of the fountain and he is flanked by tritons. Completed in 1762 it stands 25.9 meters high (approx. 83 ft.) and is 19.8 meters wide (approx. 65 ft.). The Trevi fountain is the main theme in the movies Three coins in a fountain, Roman Holiday, and Dolce Vita. The water at the bottom of the fountain represents the sea and standing with your back to the fountain and tossing a coin over your shoulder is a legend that means you will return to Rome. The Charybdis Fountain is a vortex fountain created by water artist William Pye. Charybdis was a siren who stole the oxen of Hercules. Zeus punished her by striking her with a lightening bolt and turning her into a vortex that swallowed up ships. Charybdis Fountain is the largest vortex fountain. Encased in a clear plastic type polymer with an air-core vortex that rises every 15 minutes gives this fountain look of the water standing alone. 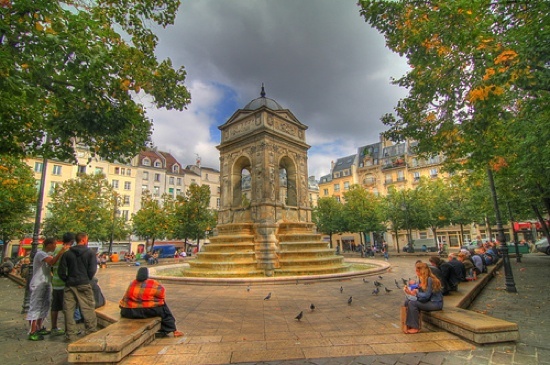 Created by artist Jean Paul Riopelle in 1969, La Joute fountain is a kinetic sculpture fountain. 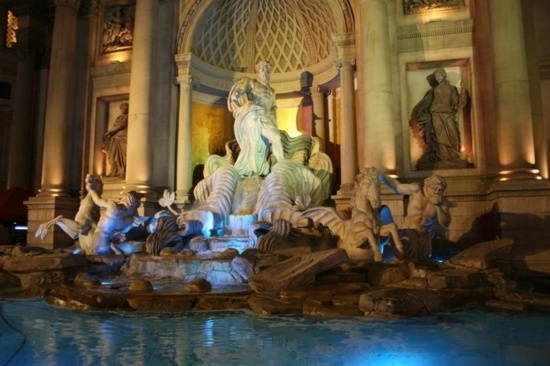 Surrounded by a pool that ignites in a timed ring of flames that lasts 7 minutes and circled by a host of bronze statues of human and animal nature. Jets form over the statues and start to create a dense mist that gas is shot through to form the fire. The whole process last about 32 minutes. 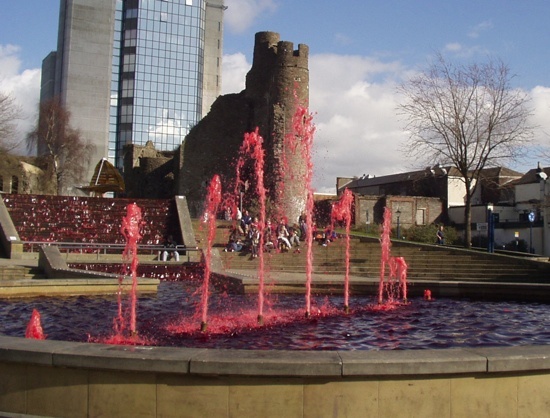 There is nothing too remarkable about this fountain except during St. David’s Day (Welsh St. Patrick’s Day) when the Castle Square Fountain and the waterfall are dyed a deep red. This gives way to their fountain being called the blood fountain. The water stays dyed red from March 1 (St. David’s Day) until March 9. Created by Alexander Calder for the Spanish Republican government to memorialize the siege of Almaden. This was first displayed in Paris in 1937 during the World Exhibition. Later it was moved to Barcelona. Not knowing the effects of mercury, it was open to everyone. Now it can be viewed behind glass so no harm comes to people from the fumes or touching the mercury.